Campbells is pleased to welcome Ms Demi McLean as the newest Articled Clerk to our training programme in 2018. Ms McLean is a graduate of the BPP University in Manchester where she was awarded a Graduate Diploma in Law and a Postgraduate Diploma in Legal Practice. Driven by a need to resolve conflict, Ms McLean has always had a passion for law and this was ignited through the debate team in high school. Originally from Cayman Brac, Ms McLean says she would not be where she is today without the support of her family and close friends who have given her help and encouragement throughout her educational endeavours. Campbells is proud to support Caymanians pursuing the study and practice of law and offers a comprehensive Articled Clerk training programme as well as sponsoring the St Ignatius A Level law programme and offering regular summer placements to aspiring lawyers. Campbells’ 18-month training program consists of carefully monitored rotations between different departments and ensures recipients receive active mentorship and a wide breadth of experience across all departments. 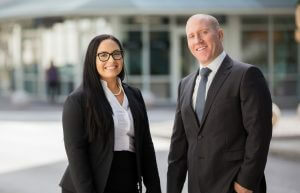 “We are very pleased to welcome Demi to the team, identifying bright Caymanian Articled Clerks for our programme is very important to the firm and we look forward to seeing Demi grow and develop through the programme and enjoy a rewarding career in the law,” says Campbells partner, Mark Goodman. The Campbells Articled Clerk training programme offers legal and professional development to qualifying Caymanians wishing to further their career in Law. It provides students with the opportunity to develop their skills and knowledge by working with experienced attorneys and participate in a leading professional programme.